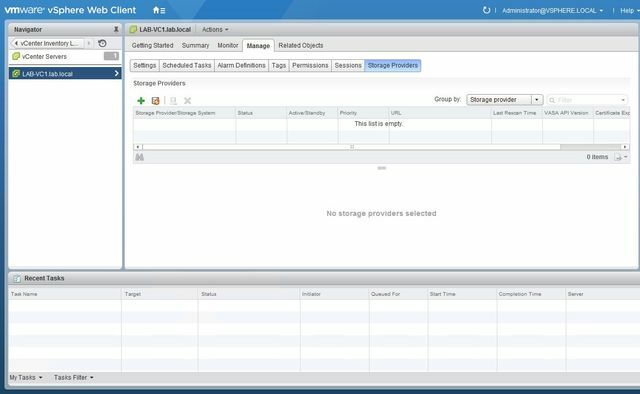 When we see storage providers in vCenter it displays empty list. This is very common issue in greenfield deployment and very easy to fix also. So, the story is when you add hosts into vCenter cluster and enable vSAN on the cluster. ESXi hosts register vsanvp with vCenter automatically and storage provider list shows storage provider list. The vCenter Server and the on-host VASA providers communicate over port 8080. This port must be open to register VASA providers. This is easy to check on either Windows or Linux vCenter. On Windows vCenter Server, check that the Windows Firewall is either disabled, or that all VMware-installed rules are active. In addition, check for custom rules that may be interfering with port 8080 outbound or inbound. Note: I always recommend to open ports 8080 & 9080 bidirectionally on the firewall or proxy exists between vCenter Server and ESXI Hosts. There are various deployment methods where vCenter Server is deployed out of clusters e.g Multilicensing vxRail clusters.